Surya Namaskar also known as Sun Salute or Salute to the Sun, is an all-time favorite of many yogis. It is a very systematic technique which combines the twelve asanas in a yoga sequence. Its root is in India where there are many Hindu worshippers of Surya who is the Sun deity. Surya refers to the Sun and Namaskar denotes bowing down. Fundamentally, yogis devote this yoga practice for the appreciation, paying of honor and reverence to the source of all forms of life, the Sun. It is commonly practice to energize the body and ease out stiffness. Why Perform Surya Namaskar in the Morning? It is very ideal to execute the Sun Salutations during sunrise and there is Science about it. According to the ancient Indian sages and saints, there are Devas or divine impulses that rule the different parts of the human body. Surya Namaskar can help you learn how to internalize the sun as part of your body system. The Surya Namaskar’s design with the twelve postures can help the twelve sun cycles become in sync with your physical cycles. The Sun Salutation can be a very good workout for the cardiovascular during a fast pace. On the other hand, it can be very relaxing and reflective when yoga postures are executed at a slower pace. Nonetheless, it is enjoyable to perform salute to the sun either way. Your body will surely stretch and become flexible with regular practice. Here are the Surya Namaskar steps that you should practice every morning with tips on how to deepen into the pose. Check them out! Stand at the end of your mat, keep your feet together and distribute your weight on both feet equally. Open your chest and just relax your shoulders. Breathe in and lift both your arms up from the sides. Exhale and bring your palms together in a prayer position in front of your chest. Activate your feet and stand as if they are tripods. Activate your legs and keep your spine erect. Breath in and lift your arms up and back. Make sure that your biceps are close to your ears. Make effort to stretch your whole body starting from the heels up to the finger tips. Push the pelvis forward just a little bit. Instead of bending backwards, reach up with fingers. Breathing out and bend forward from your waist while keeping your spine straight. Exhale and completely bring your hands down to the floor beside your feet. Bend your knees to bring your palms down to the floor. Make a moderate effort to straighten your knees. 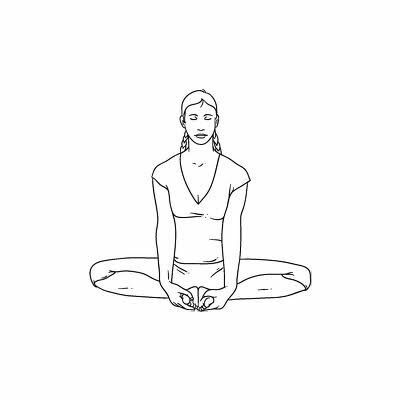 Keep your hands motionless in this position. Never move them until you compete this third sequence. Breath in and push your right leg as far back as possible. Bring your right knee to the floor and slowly look up. Check if your left foot is exactly in between the palms. Bring your whole body in a straight line. Keep your arms erect to the floor. Gradually bring your knees down to the floor then exhale. Slightly take your hips back and slide forward. Relax your chest and chin on the ground. Elevate your posterior a little bit. The eight parts of your body including two hands, two feet, two knees, chest and chin should touch the ground. Slide forward and raise your chest up into the Cobra pose. Keep your elbows bent and fixed in this pose. Inhale and make a moderate effort to push your chest forward. Exhale and make a light effort to push your navel down. Make sure that you are stretching just as much as you can and do not go beyond the limits of your body. Breath out and lift your hips as well as your tail bone up. Put your chest downwards to create an inverted V pose. Keep your heels on the ground as possible. Make a moderate effort to lift your tailbone up. Gradually go deeper into the stretch. Breath in and bring your right foot forward in between the two hands. Bring your left knee down to the ground. Press your hips down then look up. Place your right foot exactly between the two hands. Make sure that your right calf is perpendicular to the ground. You only need moderate effort in order to push your hips down towards the floor and deepen the yoga stretch. Breath out and bring your left foot forward. Keep your palms on the ground. You can bend your knees, if you feel some discomfort. Gently straighten your knees and if you can, try and touch your nose to the knees. Push your hips slightly outward. Make sure that your biceps are beside your ears. Aim to stretch up more instead of stretching backwards. Exhale and first straighten your body. Relax in this yoga pose. Observe the sensations that the Sun salutations bring in your body. For the finishing, lie down and relax your entire body in a Yoga Nidra. Your body needs sufficient time to adjust to the effects of the stretches of your sun salutations. It can bring enough rest for the mind and body. Have a great Sun Saluting!